NOTE: I wrote this post a while back and didn't have the time to finish it. Then the two tragedies (one in the US and one in India) happened, that have saddened and angered me in many ways. It has been hard for me to find the right words and coherently write about it. I pray that we all have the strength to work through these horrific incidents. And over the next year, I hope to see significant changes in everyday social and cultural terrains -- beyond legal and policy decision -- that address these incidents. Below is the post as I wrote it. How are you all? Before I could blink my eyes, Tiny M is six weeks old and Lil A is almost three. I am now carrying two little boys in my arms and feeling mighty strong. Between nursing the little one and playing cars and Thomas the train, I try to fit in cooking a little bit here and there and appreciate that my MIL is still here and makes sure we have delicious, hot food everyday. In other news, Lil A has started eating chicken. Yes, he's never been a big fan. When he was little, I would mash some in his food, but as he got older, he wouldn't do it. We have been encouraging him to try it with different recipes and somehow nothing clicked till we got some chicken shawarma home. One bite was all it took! Yay for chicken shawarma from Jersulam Garden. We are so excited by this and to encourage him we get it quite often. However, the entree comes with pitas and soon we had a big pile of pitas sitting at home. 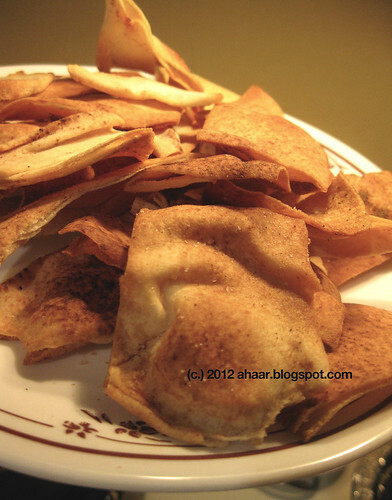 To tackle the pile, I decided to make some pita chips. 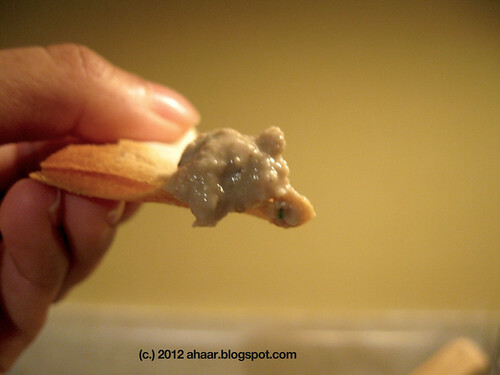 It's rather simple, and makes for a delicious appetizer for the Holiday season. This was also a big hit in our home and I have made various versions of it, some with cumin powder, some with chilli powder and some with garlic salt. You can make your own variations too. 2-3 tbspoon extra virgin olive oil. Heat the oven to 350 degC. Cut the pita in long strips. 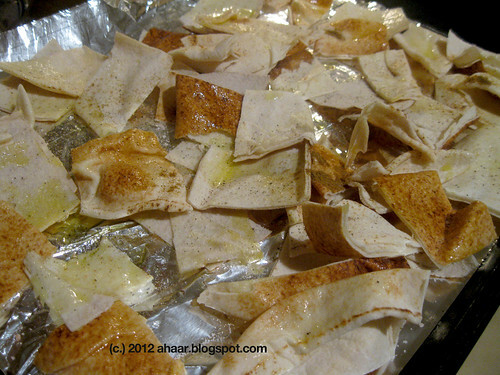 Sprinkle the spices and then the oil on top of the pita. Then rub the spices and the oil on the pita. Make sure that each pita has some oil and spice on it. Arrange it on a tray and cook it for 7-8 minutes. Turn then over and let cook for another 3-4 minutes. Cool and serve with hummus, baba ganouj, and tabouli. Yum! When I was nursing the last time, my MIL had brought over some special laddoos from India. They were made of some 20-25 ingredients and I had one everyday for a month. This time she was here so no laddoos from India. But this time she made me some delicious whole wheat panjiris. We followed the recipe from Manjula's kitchen whole wheat gaund panjiri and stored it in a box and I have been nibbling at it for the last few weeks. It's delicious! We substituted the melon seeds with pumpkin seeds but it is the edible gum which is helpful for lactating women. Another recipe for nursing mother laddoos is at Nupur's One hot stove. 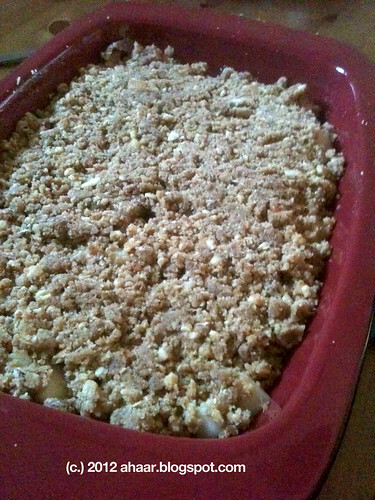 Coming back to the pear crisp, we wanted to make a simple yet delicious dessert for the Thanksgiving dinner and settled on pear crisp as we had a fresh bunch of pears at home. The crisp was easy to make and was a perfect end to the meal. 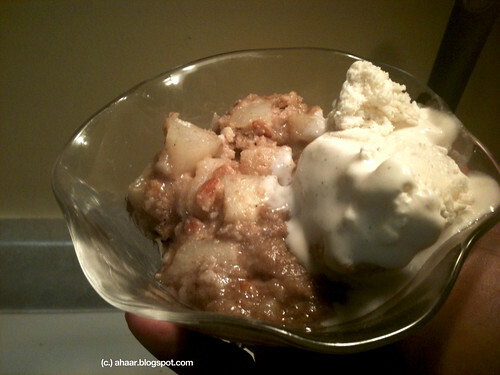 We had it with some organic vanilla bean ice-cream a friend got and the combination was just great. Heat the oven to 350 deg C.
Mix the cubed pears with lemon zest, salt, ginger and sugar and let it sit for 15-25 minutes. Now prepare the topping. 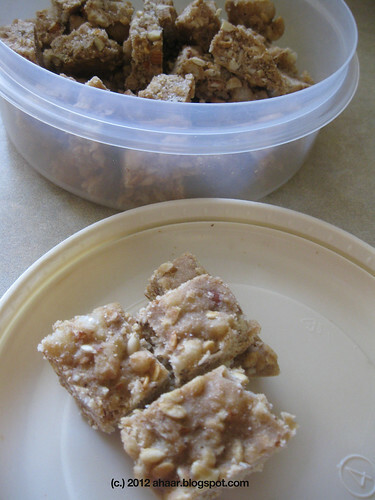 Melt the butter and coarsely chop oats and almonds together. Now mix the oats and almonds with whole wheat flour. 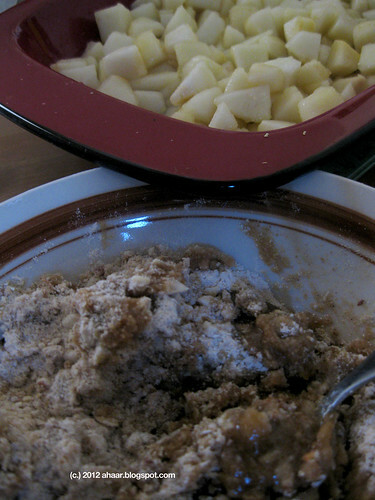 Add sugar, and cinnamon powder mix it together. Now add the melted butter and slowly mix it together till it comes together as a rough dough. Sprinkle it nicely over the pears so it forms a nice thick layer. Bake it in the oven for 30 min and then brown it on high heat for another 5 min. Serve warm with some vanilla ice-cream.